Yesterday we picked our first watermelon of the season from our garden. It was so exciting. We were out gathering the days bounty when the children begged me to check them. I told them that we had to *thump* a watermelon to see if it is ripe. We went over to thump the melon and indeed it sounded hollow. They were excited beyond words. We brought it in, cut it open for lunch and it was perfection! A gal on facebook insisted that I try watermelon salad. I had never heard of it, but looked it up and was happily surprised at the interesting list of ingredients. It was perfection. The tastes and the textures... oh my it was good! I am going to post the recipe below, but know, I didn't have red wine vinegar, so I used balsamic and I really liked it that way! And, I didn't have any mint. At least I didn't have any at the time I made it, it was pouring outside and didn't want to go out to the herb bed to pick in the rain. Cut the flesh from the melon and cut into bite size pieces, removing and discarding the seeds, and set aside. Peel and slice the onion into rings. In a small bowl, combine the vinegar, salt, pepper, and whisk until salt is dissolved. Slowly whisk in the olive oil, a few drops at a time. Add in the chopped mint, taste, and adjust seasonings. 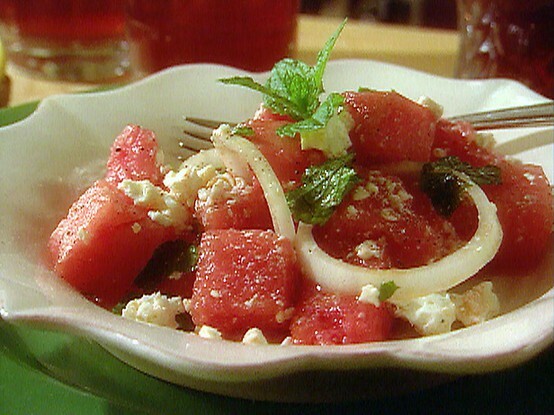 In a large bowl, combine the melon, onion, and feta. Pour the dressing over the melon mixture and toss gently until everything is coated and evenly mixed. Garnish with mint sprigs. To serve, divide salad among individual plates and garnish with mint leaves. Interesting. I may have to try it. My husband would not like it (at least the feta cheese part), but I like all those ingredients. Watermelon and onions... hmmm. well, I guess it doesn't hurt to try. You sure do make it *look* good!